My daughter Evanthe Gupta is around 9 years old. She already started solving Sudoku and recently got qualified for National Finals of Sudoku Champs 2015. Sudoku Champs 2015 is Sudoku competition in India to select India Junior Sudoku team for 1st World Junior Sudoku Championship to be held in Beijing, China in July 2015. Now a days I am creating some easy puzzle for her practice. I am starting with Mini Classic Sudoku and later will slowly introduce her to variations with the help of Mini Easy Sudoku. 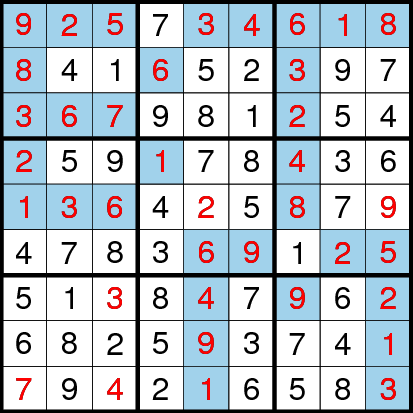 Today only I created this Sudoku and posting it as 11th Sudoku in in Mini Sudoku Series. Fill in the grid from 1 through 6 so that every row, every column and every 3x2 boxes region contains distinct digits. Here is answer Fun With Sudoku Series Puzzle titled "Classic Sudoku (Fun With Sudoku #20)"